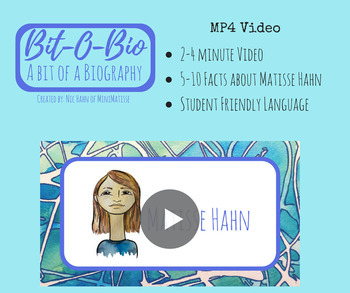 This lesson is created as a way to introduce students to a short biography of influential people. The targeted age group of Bit-O-Bio is elementary age students. The lesson is designed to be presented as a warm up or brain break during class. The short video can be played for students explaining 3 to 5 facts about the highlighted person. 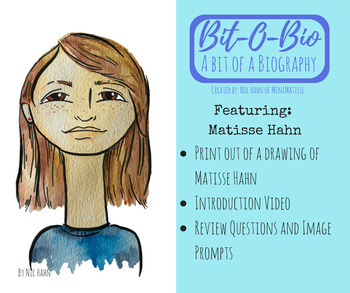 A drawn image of the person is included in this packet for a prompt. 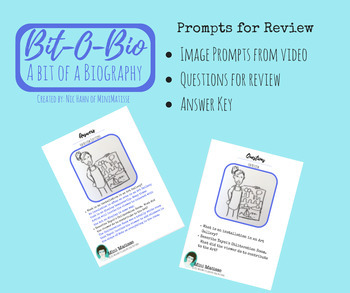 Prompt cards and images will support a review of the influential person. 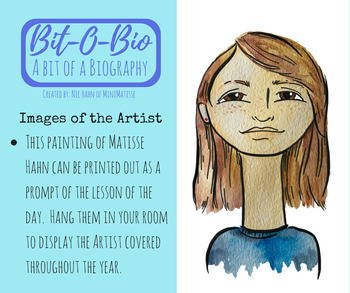 This particular Bit-O-Bio is about a 9-year-old artist named Matisse. She represents our students. It is to show kids you don't have to 'grow-up' before you can 'become' an Artist. Students can be an artist right now! !